Sokha Beach Resort, the 5-star luxury resort owned by Cambodian, announced today has received “The Best 5 Star Hotel in Cambodia” certificate of appreciation by Ministry of Tourism, Cambodia. The recognition is presented in the 9th International Travel Expo’s Cambodia Night held at Rex Hotel in Ho Chi Minh City, Vietnam. The certificate is only given to outstanding performers of the hospitality industry who have shown commitment and effort towards service excellence. This acknowledgement is considered as an honour and pride to all Sokha Beach Resort’s staffs who have made their best to provide guests a memorable experience. “We are delighted to have received the certificate. This is the result and evidence of our commitment to the hospitality industry. We will keep having our resort a remarkable name with the excellence in comfort and with the excellent quality in service offered.” Said Mr. Jeffrey Sussman, general manager at Sokha Beach Resort. Sokha Beach Resort is an affiliate of WORLDHOTELS and is one of the properties under Sokha Hotels & Resorts located in the Sihanouk Ville. The resort was opened its door to public on 08 April 2004 and is the only 5-star beach resort in the town with 1.5 kilometres white sandy beach and many facilities range from peaceful spa, swimming pool to excited watersports and more. 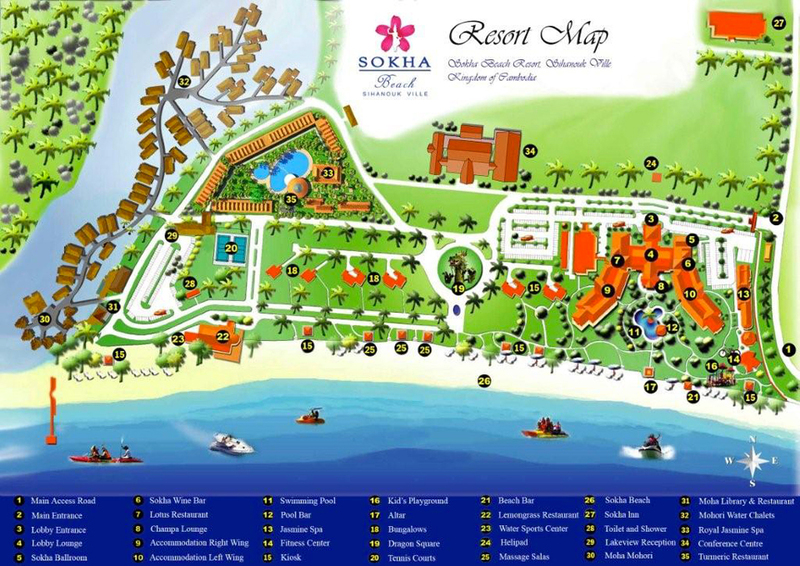 Sokha Beach Resort is just 2 minute drive from the downtown. Most recent booking for this resort: less than 8 hours ago from Spain. Don’t miss your chance to stay at Sokha Beach Resort!